See present and probable tuition charges for Campbellsville University, as well as just how these expenses contrast to regional and nationwide averages. Understanding tuition and fees related to going to Campbellsville University will allow you to plan economically for 4-6 years. Look at the numbers below to know how Campbellsville University's price measures up to other schools and if you need to plan for tuition increases. How do Tuition & Fees at Campbellsville University Compare to Other Colleges? For nationwide, regional and statewide comparisons, check out the table below to find out how Campbellsville University compares to other colleges. How Much Does Campbellsville University Charge for Tuition? Full-time students at Campbellsville University were charged $25,400 in fees and tuition in the 2017 - 2018 academic year, before corrections for financial aid. $24,900 was the price tag on tuition. $500 was the charge for fees. Regrettably, this college doesn't offer any tuition discounts to in-state students. Check out the table below to find 2017 - 2018 school year costs. How much does Campbellsville University cost part time? For more information, visit Campbellsville University Part Time Tuition & Fees. There continues to be a growth of 3.2% in Campbellsville University fees and tuition for out-of-state students in the past five years. Tuition increased by 3.3% and fees increased by 0.0%. This school year, undergraduates can expect to pay $26,218 if the growth keeps up. Because of price growth, the total expense of a four-year Campbellsville University degree would be $110,046, and the total price of a two-year degree would be $53,280, which doesn't include extra expenses for books, transportation, and room and board. 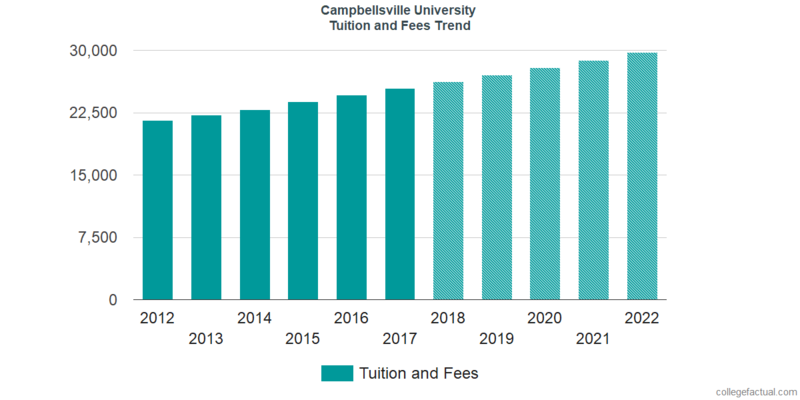 The next chart displays estimated upcoming fees and tuition for undergrads at Campbellsville University. Be aware of just how much the tuition and fees are growing each year. At most colleges undergrads will wind up spending more on their last year of school compared to what they did for their first. Discover our answers to frequently asked questions and get additional information about college tuition and fees.